"Oh My Goddess" redirects here. For the two-part episode in Charmed, see Oh My Goddess (Charmed). For other uses, see Oh My Goddess (disambiguation). Cover of the first North American compiled volume. Oh My Goddess! (Japanese: ああっ女神さまっ, Hepburn: Aa! Megami-sama), or Ah! My Goddess! in some releases, is a Japanese seinen manga series written and illustrated by Kōsuke Fujishima. It has been serialized in Afternoon since September 1988; the individual chapters are being published in tankōbon by Kodansha, with the first released on August 23, 1989; the final volume of the manga series, volume 48, was released on July 23, 2014, marking nearly 26 years of publication. 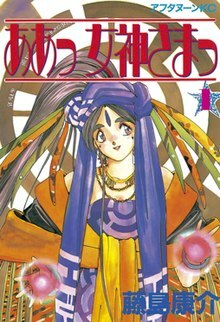 The series follows college sophomore Keiichi Morisato and the goddess Belldandy who moves in with him in a Buddhist temple; after Belldandy's sisters Urd and Skuld move in with them, they encounter gods, demons and other supernatural entities as Keiichi develops his relationship with Belldandy. The chapters have been adapted into an original video animation produced by Anime International Company (AIC), and an anime series which aired from 2005 to 2006. Additionally, AIC has developed two OVAs and a film, and OLM, Inc. has also developed an anime series as well. Companies have developed thousands of types of merchandise, such as video games, and a light novel. The manga series has been licensed for an English-language release by Dark Horse Comics. The OVA was licensed by AnimEigo, while the film was licensed by Geneon Entertainment, and the various TV series was licensed at various points by Media Blasters, ADV Films and Funimation. Keiichi Morisato is a college sophomore who accidentally calls the Goddess Help Line. The goddess Belldandy materializes and tells him that her agency has received a system request from him and has been sent to grant him a single wish. Believing that a practical joke is being played on him, he wishes that she will stay with him forever, and his wish is granted. Since he is unable to live with Belldandy in his male-only dorms, they are forced to look for alternative housing, eventually seeking shelter in an old Buddhist temple. They are allowed to stay there indefinitely after the young monk living there leaves on a pilgrimage to India upon being impressed by Belldandy's intrinsic goodness. Keiichi's life with Belldandy becomes even more hectic when her elder sister Urd and her younger sister Skuld move in as well. A series of adventures ensue as his relationship with Belldandy develops. The Oh My Goddess! universe is fashioned loosely around Celtic/Norse Mythology; various names and concepts are recycled for humor. Three worlds exist in the Universe of Oh My Goddess: Heaven, Hell, and Earth. Heaven is the realm of the All Mighty and goddesses, Hell is the realm of Hild and demons, and Earth is the realm of humans. Reality is controlled by an enormous and complex computer system, named Yggdrasil. Each goddess is assigned Class, Category, and Restrictions. Class indicates power and skill in performing pure magic. First Class goddesses are held to a stricter standard regarding the prohibition to lie. There are also three categories: Administration, Commercial (Field), and Special Duty. Limited and Unlimited restrictions indicates boundaries on permitted actions. Goddesses may be penalized for dereliction of duty and may have their license suspended for a time. A goddess using her powers during suspension will have her license permanently revoked. Belldandy is a Goddess First Class, Second Category, Unlimited License. Urd and Skuld are Goddesses Second Class, First Category, Limited License. Goddesses also wear power limiters, usually in the form of jewelry. The goddesses' purpose is to bring happiness to everyone around them. Toward that end, Heaven has created the Goddess Technical Helpline (also called Goddess Relief Agency), designed to bring happiness to the people of Earth, especially those with great virtue but terrible misfortune. A competing institution named the Earth Assistance Center, also is staffed by goddesses. In most scenarios, a goddess appears before one that the system has deemed worthy and grants him or her one wish. The wish must be approved by the system, after which a contract is created between the human and the goddess and stored on the Yggdrasil system as a file. The wish contract file is protected by a passcode known to the Goddess. As demons work toward the opposite end, the total happiness on Earth must remain in balance. Heaven and Hell strictly abide by an agreement to work through contracts and to prevent bloodshed between them, each god is linked to a demon by a life contract, thus if one of them is killed, the other perishes as well, with their memories of the contract erased to ensure no one knows who is paired with whom. Demons have similar class and license restrictions, and are accompanied by familiars instead of angels. A seal exists between the demon world and Earth, named the Gate to the Netherworld. It was "created by the gods and can only be broken by an instrument of the gods." As such, demons require a catalyst to manifest on Earth. The demons possess a system similar to Yggdrasil, named Nidhogg. Both demons and goddesses possess the power to seal beings away. The demons also operate in a fashion similar to goddesses by creating contracts with humans and offering them wishes, but often at a price. A goddess does not have an angel automatically, but receives one in egg form. When her power matures, the egg hatches into an angel, becoming a lifetime companion. The angel always obeys the goddess, being a reflection of the goddess' inner self. Other creatures that exist in the Earth plane are a multitude of spirits that are responsible for almost every aspect of life. These include the spirits of Money, Wind, Engine and such. More specific entities include Earth spirits, which are guardians over a specific area of land. Morgan le Fay, a villain from the movie, is probably a high ranking Earth spirit (or a being from another dimension, but that is less likely because her tragic love story with a human must have happened on Earth) who demonstrates great strength fighting Belldandy and Urd, even though her powers are less potent than the ones of goddesses of their level. Before starting work on Oh My Goddess!, Kōsuke Fujishima created the manga You're Under Arrest!. Miyuki Kobayakawa, one of the principal characters of You're Under Arrest!, was featured as a goddess character in a four-panel gag strip in the manga. While the exact relationship between this initial goddess character and the Oh My Goddess! series is unclear, there are suggestions that Oh My Goddess! can be viewed as a spin-off series. Irrespective of the origin, the concept of a goddess "as a job" interested Fujishima, leading to the first appearance of the Oh My Goddess! series in the September 1988 issue of the magazine Afternoon. Translating the original Japanese title of Aa! Megami-sama! (ああっ女神さまっ) proved to be problematic. Fred Patten, in writing the preface to the collection "Watching Anime, Reading Manga: 25 Years of Essays and Reviews", stated that fans were still debating whether "Ah! My Goddess" or "Oh My Goddess!" should be used at the time of writing, approximately 15 years after the first Oh My Goddess! manga was published. When the United States anime import company AnimEigo obtained the original video animation (OVA) rights, they titled the series Oh My Goddess!. This approach was also followed by Toren Smith and Dark Horse Comics when translating the manga. Released in concert with the OVA series in 1994, Smith has since stated that he saw the title as a play on "Oh my god! ", and felt that there was no problem when translating it. Smith confirmed that his interpretation of the author's intent was correct by consulting with Fujishima. Nevertheless, Kodansha's bilingual release of the manga used Ah! My Goddess, as did Pioneer's North American release of the film, and Media Blasters's 2005 DVD release of the TV series. Fujishima stated in Animerica that "Oh" was closer to his intent, but acknowledged that the title should be rendered so as to make sense within the country that it is published, and specifically stated that films may warrant different titles than other works. He did, however, state that he would prefer to see consistency between the titles of the manga and those of the animations. Oh My Goddess! premiered in the September 1988 issue of the monthly Japanese magazine Afternoon and concluded in the June 2014 issue. The individual chapters were collected and published in tankōbon volumes by Kodansha. The manga was collected in 48 volumes, with the first volume released on August 23, 1989, and the final volume released on July 23, 2014. The series is licensed for an English-language release in North America by Dark Horse. The company initially published the first 112 chapters individually, with the first chapter released on August 1, 1994, and chapter 112 on September 1, 2004, until volume 19/20, after which they only published the collected volumes. They also serialized individual chapters in their defunct manga anthology, Super Manga Blast!. The first three volumes have had three different releases; they were initially published in a single abridged volume titled "1-555-GODDESS" on November 1, 1996, and were later re-released in unabridged volumes between June 5 and October 7, 2002. The first 129 chapters were redistributed between volumes 1 through 20 so that each volume better followed story arcs; after this reordering, the English release had 19 volumes. The fourth volume was released on October 15, 1997; volume 19, which Dark Horse numbered "19/20" and which ended on the same chapter as the Japanese volume 20, was released on January 19, 2005. After this release, they began republishing the first 20 volumes, this time following the Japanese chapter layout and using a new translation; they also continued publishing volumes from 21 on, these also followed the original Japanese chapter layout. The third re-release of volume 1 was on December 7, 2005, and the re-release has reached volume 12, which was released on June 24, 2009. Volume 21 was published by Dark Horse on July 6, 2005, and volume 33 was released on August 29, 2009. On August 6, 2014, Dark Horse published the 46th volume of the manga series. On March 19, 2014, it was announced that the series would conclude with the 48th volume, which was released in North America on October 20, 2015. The final volume of the manga was also released in Japan as a limited ion box set containing a special ion of volume 48, a mini book of all the Adventures of Mini-Goddess comics that appeared in the first volumes of the manga, a drama CD featuring the anime voice actors, and a selection of high quality prints of past volume covers, and the final volume cover. The first novel of the series, Oh My Goddess! First End, was written by Urd's voice actress, Yumi Tōma, with the illustrations done by Fujishima and Hidenori Matsubara, the animation director for several of the series' animated adaptations. The story follows the manga, taking place three years after Belldandy and Keiichi first meet. The novel was first published in Japan on July 20, 2006 by Kodansha; it was then licensed in English by Dark Horse and released in North America on December 12, 2007. In 1993, Anime International Company, KSS, Tokyo Broadcasting System and Kodansha teamed up to produce a five-episode original video animation (OVA) series based on the manga series. Directed by Hiroaki Gōda and distributed by Pony Canyon, the first episode was released on February 21, 1993, and the final was released on May 17, 1994. The screenplay was written by Kunihiko Kondo and Nahoko Hasegawa, and the music was provided by Takeshi Yasuda. The character designer was Hidenori Matsubara. The OVA was licensed for release in North America by AnimEigo, who released all five episodes in individual VHS volumes in both English-language and subtitled Japanese-language ions between June 29, 1994 and August 31, 1994. They later released all five episodes across two DVD volumes in 2001, then re-released the episodes in a single "Remastered Collector's Edition" set in 2006. AnimEigo's license expired at the end of February 2010. In March 2010, TBS announced they were producing a brand new 7-minute OVA for release only with a repackaged and redesigned boxed set for Season 1. Currently, no plans exist for licensing that special OVA episode. The OVA was the first new anime production since "Fighting Wings" was produced for the 20th anniversary of the manga series. Kodansha released the first OVA for the anime series, bundled with volume 42 of the manga series on February 23, 2011. Volume 42 of the tankouban series was released in two versions, in a standard version without the OVA and a limited ion release contains the OVA. Kodansha produced a second OVA for the anime series. Volume 43 of the tankouban series includes this OVA for the anime series, and it was bundled with the manga release on September 23, 2011. A third OVA was released in the summer of 2013 bundled together with the 46th Manga release. A film, titled Ah! My Goddess: The Movie (劇場版ああっ女神さまっ, Gekijōban Aa! Megami-sama), premiered in Japan in 2000. It saw the return of the main cast, along with several popular characters from the manga who had not appeared in any of the previous anime. It is distributed in Japan by Shochiku and in North America and United Kingdom by Geneon Entertainment in 2001. The plot does not seem to follow any of the existing canon, but uses plot devices from several different story arcs from the manga, mostly the Lord Of Terror arc. A 48 episode TV series called Adventures of Mini-Goddess (ああっ女神さまっ 小っちゃいって事は便利だねっ, Aa! Megami-sama! Chicchaitte Koto wa Benri da ne) and featuring shrunken versions of Urd, Belldandy, and Skuld in a comedic super deformed style was produced by Oriental Light and Magic and aired on WOWOW from April 6, 1998 through March 29, 1999 as a part of the omnibus show Anime Complex. It is distributed in Japan by Pony Canyon and in North America by Geneon Entertainment. This series departs the most from the original manga storyline, and has almost no continuity with the previous series. The series revolves around the three goddesses and their rat companion Gan-chan, following their adventures in their temple home. The goddesses remain constantly in miniaturized form, for apparent freedom of space and in order to properly interact with Gan-chan. Oh My Goddess! saw another TV iteration under the name Ah! My Goddess in 2005. The episodes, which followed the manga closely, were directed by Hiroaki Gōda, animated by Anime International Company, and produced by Tokyo Broadcasting System (TBS). The season began in Japan, on TBS, on January 6, 2005, and ended on July 7, 2005. Bandai Visual released the episodes in Japan between April and November 2005, as eight DVD compilations each containing three episodes. The two original video animations (OVAs), which had not been broadcast, were released on a special DVD on December 23, 2005. The series was licensed for a Region 1 release by Media Blasters. Six DVD compilations, containing all twenty-six episodes, were released between September 2005 and July 2006. Each DVD contained four episodes, excluding the first two, which contained five each. A premium complete season box set was released on November 7, 2006; the regular set followed on November 27, 2007. MVM Films distributed the series in the United Kingdom, with the individual volumes released between February and December 2007 in six similar DVD compilations. The box set followed in July 2008. Media Blasters confirmed on Facebook that the license to Ah! My Goddess has been expired, leaving the series out-of-print, but these episodes are still available on Hulu despite the license expiration. The success of the first season inspired a second season titled Ah! My Goddess: Everyone Has Wings, released as Ah! My Goddess: Flights of Fancy in North America. Also directed by Hiroaki Gōda, animated by Anime International Company, and produced by Tokyo Broadcasting System, the series covered the adventures of Keiichi and Belldandy in the aftermath of the Lord of Terror fiasco. It premiered on TBS on April 6, 2006 and concluded on September 14, 2006, picking up the story from where the series left off in season one. Season two concluded with episode 22, although the Japanese and North American DVD releases include episodes 23 and 24. It was released to DVD in Japan between July 2006 and February 2007 by Bandai Visual. Media Blasters, who released the first season, passed up on this season and it was licensed to ADV Films instead. ADV Films released the season on six DVD compilations, each containing four episodes, between May 2007 and March 2008. The rights were then transferred to Funimation, who released a box set on November 25, 2008. In 2007, Ah! My Goddess: Fighting Wings, a two-episode special to commemorate the 20th anniversary of the original publication of Oh My Goddess!, was released. It was directed by Hiroaki Gōda, animated by Anime International Company, and produced by Tokyo Broadcasting System. The episodes aired on December 9, 2007 and Bandai Visual released the episodes on a single DVD in Japan on February 22, 2008. The episodes have not been licensed for a Region 1 release. The Japanese voice actors of the series are also professional singers. Either in the form of Goddess Family Club or an original soundtrack, the series has led to over a dozen albums. An adventure game titled Aa! Megami-sama! for the NEC PC-9801 was released in 1993 by Banpresto. An enhanced port was later released in 1997 for the PC-FX which added voice and other improvements. A Dreamcast quiz game titled Quiz: Ah! 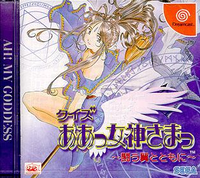 My Goddess - Stay With Fighting Wings was released in August 1998 for the Sega Dreamcast. Player plays as Keiichi Morisato answering to questions posed by characters from the anime/manga such as Belldandy, Skuld, Urd, Lind and Peorth. In February 2007 an Ah! My Goddess game developed by Marvelous Interactive was released in Japan for the PlayStation 2. The game was only released in Japan and was released in 2 ions, the limited ion (also known as the "Holy Box" ion) and the regular DVD ion. Currently there have not been any plans for the game to be licensed and translated into English. In 2009, Ah! My Goddess won Kodansha's award for Best General Manga, and the most recent volume, 41, was the tenth best-selling manga in Japan upon its release that week according to the Oricon Japanese Comic Rankings charts. The film ranked #28 on Wizard's Anime Magazine on their "Top 50 Anime released in North America". In the American Anime Awards from 2007, the anime series was a nominee in the category Best Comedy Anime, but lost to FLCL. ^ "OH MY GODDESS! OMNIBUS BOOK 1 TPB". Dark Horse Comics. Retrieved May 27, 2018. ^ "New xxxHOLiC Series, Ah! My Goddess TV Special Revealed". Anime News Network. Retrieved August 4, 2018. ^ a b "Ah! My Goddess/Aa Megami-sama Manga to End in April". Anime News Network. 2014-03-19. ^ "Ah! Urd's Small Love Story?." Ah! My Goddess. Dir. Hiroaki Gōda. TBS, Tokyo, Japan. 23 Dec 2005. ^ "Ah! I Shall Grant Your Wish!." Ah! My Goddess: Flights of Fancy. Dir. Hiroaki Gōda. TBS, Tokyo, Japan. 18 May 2006. TV. ^ "Ah! I Wish...Once More!." Ah! My Goddess: Flights of Fancy. Dir. Hiroaki Gōda. TBS, Tokyo, Japan. 06 Apr. 2006. TV. ^ "Ah! I Want To Fill The World With Happiness!." Ah! My Goddess: Flights of Fancy. Dir. Hiroaki Gōda. TBS, Tokyo, Japan. 27 Apr 2006. TV. ^ "Ah! The Chair of Demonkind Descends!." Ah! My Goddess: Flights of Fancy. Dir. Hiroaki Gōda. TBS, Tokyo, Japan. 26 July 2006. TV. ^ a b "Ah! My Darling Cupid!." Ah! My Goddess: Flights of Fancy. Dir. Hiroaki Gōda. TBS, Tokyo, Japan. 06 July 2006. TV. ^ Ulmer, Jeff (October 5, 2001). "Oh My Goddess! #1 (Review)". Digitally Obsessed. Retrieved 2008-04-09. ^ Gubbins, Paul. ""You're Under Arrest!" TV series FAQ". Anime on DVD. Archived from the original on March 25, 2006. Retrieved 2008-03-31. ^ Fujishima, Kōsuke (February 7, 2007). "Letters to the Enchantress". Oh My Goddess!. 4. Milwaukie, OR: Dark Horse Manga. p. 187. ISBN 1-59307-623-1. ^ McCarthy, Helen (2006). 500 Manga Heroes and Villains. Collins & Brown. p. 95. ISBN 1-84340-234-3. ^ Patten, Fred (2004). Watching Anime, Reading Manga: 25 Years of Essays and Reviews. Stone Bridge Press, LLC. p. 11. ^ "Oh My Goddess - Anime Products". AnimEigo. Archived from the original on 2008-06-24. Retrieved 2008-07-09. ^ Fujishima, Kōsuke (April 12, 2006). "Letters to the Enchantress". Oh My Goddess!. 2. Milwaukie, OR: Dark Horse Manga. p. 181. ISBN 1-59307-457-3. ^ Fujishima, Kōsuke (April 12, 2006). "Letters to the Enchantress". Oh My Goddess!. 2. Milwaukie, OR: Dark Horse Manga. p. 182. ISBN 1-59307-457-3. ^ "Popular Works: Ah! Megami Sama/Ah! My Goddess!". Kodan Club.com. Archived from the original on May 31, 2008. Retrieved 2008-07-09. ^ a b Fujishima, Kōsuke (February 7, 2007). "Letters to the Enchantress". Oh My Goddess!. 4. Milwaukie, OR: Dark Horse Manga. p. 188. ISBN 1-59307-623-1. ^ ああっ女神さまっ(1) 藤島康介 (in Japanese). Kodansha. Retrieved January 17, 2009. ^ "ああっ女神さまっ（４８）＜完＞" [Oh My Goddess 48 (finale)] (in Japanese). Kodansha. Retrieved November 6, 2015. ^ ああっ女神さまっ(39) 藤島康介 [Oh My Goddess (39) Kōsuke Fujishima] (in Japanese). Kodansha. Retrieved August 8, 2009. ^ "Oh My Goddess! #1 :: Profile". Dark Horse Comics. Retrieved March 31, 2009. ^ "Oh My Goddess! #112 - Sora Unchained (Part 8 of 8)". Dark Horse Comics. Retrieved March 31, 2009. ^ "Super Manga Blast! #1 :: Profile". Dark Horse Comics. Retrieved April 17, 2009. ^ "Super Manga Blast! #12 :: Profile". Dark Horse Comics. Retrieved April 17, 2009. ^ "Oh My Goddess! : 1-555-GODDESS TPB :: Profile". Dark Horse Comics. Retrieved March 31, 2009. ^ "Oh My Goddess! Volume 1: Wrong Number TPB :: Profile". Dark Horse Comics. Retrieved January 23, 2009. ^ "Oh My Goddess! Volume 3: Final Exam TPB :: Profile". Dark Horse Comics. Retrieved January 23, 2009. ^ "Oh My Goddess! Volume 4: Love Potion No. 9 TPB :: Profile". Dark Horse Comics. Retrieved January 23, 2009. ^ "Oh My Goddess! Volume 19/20 TPB: Sora Unchained :: Profile". Dark Horse Comics. Retrieved January 23, 2009. ^ "Oh My Goddess! Volume 1 TPB :: Profile". Dark Horse Comics. Retrieved January 23, 2009. ^ "Oh My Goddess! Volume 12 TPB :: Profile". Dark Horse Comics. Retrieved January 23, 2009. ^ "Oh My Goddess! Volume 21 TPB :: Profile". Dark Horse Comics. Retrieved January 27, 2009. ^ "Oh My Goddess! Volume 33 TPB :: Profile". Dark Horse Comics. Retrieved March 31, 2009. ^ "小説版 ああっ女神さまっ 初終 First End(ファーストエンド) 冬馬由美 藤島康介". Kodansha. Retrieved April 17, 2009. ^ "Oh My Goddess! First End (Novel) :: Profile". Dark Horse Comics. Retrieved April 17, 2009. ^ Cavallaro, Dani (2010). Magic as metaphor in anime : a critical study. Jefferson, N.C.: McFarland & Co., Publishers. p. 197. ISBN 978-0-7864-4744-2. ^ "Oh My Goddess 1 [VHS]". Amazon.com. Amazon.com. ^ "AnimEigo's Oh My Goddess Video Series License Expires". (February 4, 2010) Anime News Network. Retrieved February 4, 2010. ^ 春の新番組 [New Spring Shows]. Animage (in Japanese). Tokyo, Japan: Tokuma Shoten. 238 (April 1998): 188. April 10, 1998. ^ a b ああっ女神さまっ　小っちゃいって事は便利だねっ(1998) [Ah! My Goddess: Being Small Is Convenient] (in Japanese). Allcinema.net. Retrieved 2009-02-20. ^ "Animation World". Animage (in Japanese). Tokyo, Japan: Tokuma Shoten. 250 (April 1999): 144. April 10, 1999. ^ Martin, Theron (2006-07-28). "Ah! My Goddess DVD 6 - Review". Anime News Network. Retrieved 2009-01-07. ^ "ああっ女神さまっ Season 1 episode list" (in Japanese). Tokyo Broadcasting System. Archived from the original on 2007-10-28. Retrieved 2008-11-14. ^ "Ah! My Goddess, Volume 1 (DVD)" (in Japanese). Amazon.co.jp. Retrieved 2009-01-08. ^ "Ah! My Goddess, Volume 8 (DVD)" (in Japanese). Amazon.co.jp. Retrieved 2009-01-08. ^ "Ah! My Goddess Special (DVD)" (in Japanese). Amazon.co.jp. Retrieved 2009-01-08. ^ "Media Blasters Sets Release Dates for New Acquisitions, Series Boxes". Anime News Network. 2007-08-19. Retrieved 2009-02-01. ^ "Ah! My Goddess, Volume 1: Always and Forever (2005)". Amazon.com. Retrieved 2009-01-08. ^ "Ah! My Goddess, Volume 6: Last Dance (1997)". Amazon.com. Retrieved 2009-01-08. ^ "Ah! My Goddess - Premium Box Set (1997)". Amazon.com. Retrieved 2009-01-08. ^ "Ah! My Goddess - Season 1 Complete Collection (2005)". Amazon.com. Retrieved 2009-01-08. ^ "Ah! My Goddess Vol.1". Amazon.com. Retrieved 2009-01-07. ^ "Ah! My Goddess Vol.6 (2005)". Amazon.com. Retrieved 2009-01-07. ^ "Ah! My Goddess Vol.1-6 (2005)". Amazon.com. Retrieved 2009-01-07. ^ "ああっ女神さまっ Season 2 episode list" (in Japanese). Tokyo Broadcasting System. Archived from the original on 2007-09-29. Retrieved 2008-11-14. ^ "ああっ女神さまっ それぞれの翼 1". Amazon.co.jp. Retrieved 2009-01-13. ^ "ああっ女神さまっ それぞれの翼 8". Amazon.co.jp. Retrieved 2009-01-13. ^ "Media Blasters Passes on Goddess Season 2". Anime News Network. 2006-11-07. Retrieved 2009-01-13. ^ "Ah! My Goddess Season 2: Flights of Fancy, Vol. 1 - Everyone Has Wings". Amazon.com. Retrieved 2009-01-13. ^ "Ah! My Goddess, Season 2 : Flights of Fancy Vol. 6: Love Will Keep Us Together". Amazon.com. Retrieved 2009-01-13. ^ "Funimation Picks Up Over 30 Former AD Vision Titles". Anime News Network. 2008-07-04. Retrieved 2009-01-13. ^ "Ah! My Goddess: Flights of Fancy - Season 2 Set". Amazon.com. Retrieved 2009-01-13. ^ "New xxxHOLiC Series, Ah! My Goddess TV Special Revealed". Anime News Network. 2007-08-11. Retrieved 2009-01-23. ^ "Ah! Megami-sama: Tatakau Tsubasa". Newtype USA 6 (12) 15. December 2007. ISSN 1541-4817. ^ 20th Anniversaryああっ女神さまっ闘う翼. Media Arts Database (in Japanese). Agency for Cultural Affairs. Retrieved April 11, 2015. ^ ああっ女神さまっ 闘う翼 (in Japanese). Amazon.co.jp. Retrieved 2009-01-23. ^ "Japanese Comic Ranking, July 19-25 (Updated) posted on 2010-07-28 18:00 EDT". Anime News Network. 2010-07-28. Retrieved 2015-11-06. ^ "Wizard lists Top 50 Anime". Anime News Network. 2001-07-16. Retrieved 2014-02-02. ^ "Finalists for the American Anime Awards". ICv2. August 2, 2007. Retrieved June 26, 2011. Wikiquote has quotations related to: Oh My Goddess!